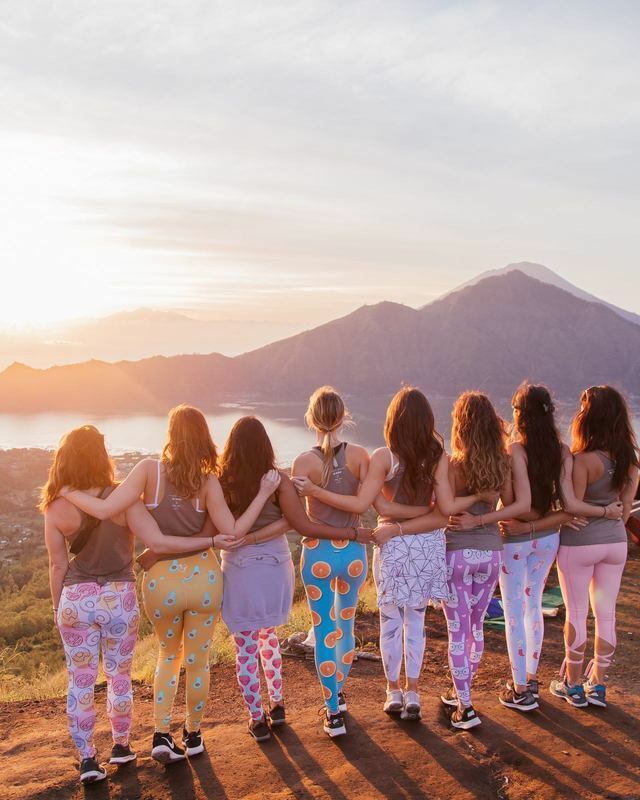 In this post, Bali alumni Katie talks about the global sisterhood that is the Pangea Dreams alumni community! It would be impossible to write down what happens every second of every day on a Pangea Dreams retreat; There’s just too much to say. You learn to much, experience too much, try too many new things, and overcome so much more than can ever be conveyed solely through the medium of writing. It’s one of those things you can’t just live vicariously through someone else to understand it; you have to experience it for yourself. But I can tell you one thing: you don’t stop benefitting from a Pangea Dreams retreat at the end of the week. You reap the benefits of attending one of these retreats for literally the rest of your life, because no matter what you choose to do with all of the knowledge and tools given to you about Instagram and content creation, you’ll always have the friendship of the girls who go on the retreat with you. And trust me, I’m 100% aware of how trite that sounds. I don’t care, though, because it’s true. I could literally delete my Instagram tomorrow and every single one of those girls would still message me, invite me to come to stay with them, and support and encourage me in any career path I chose. The network of powerful, ambitious women created over the course of the week-long Bali retreat (and really the entire network of Pangea Dreams alum) is what I love most about everything I gained from this experience. I mean, before the 12 of us had even said goodbye, we created a WhatsApp group AND an Instagram DM group chat so that we could all keep in touch as much as possible. Take it from someone whose life has literally revolved around travel since the day I first stepped off a plane onto international soil when I was 19: when you meet people while traveling, it’s common to exchange contact info, promise to keep in touch, and talk about “meeting up again somewhere in the world.” What isn’t common, however, is actually following up on all that. Since leaving Bali almost two months ago, not a day has gone by that I haven’t talked to at least one of the girls, either on WhatsApp or Instagram. We’re constantly asking each other for help and getting each other’s opinions about our Instagram feed, our photo edits, our blog layouts, you name it. We share our successes (like when one of the girls got an amazing collaboration in India or when I had an Instagram post hit 500 likes for the first time) and our frustrations (when our photos don’t do as well as we hoped, or when we lose more followers than we gain). Our group chats have morphed into mini-PDR retreats, where we offer advice and encouragement, seek help, and pretty much just do whatever we can to build each other up and support one another. When I’m nervous about reaching out to hotels for a collaboration… I head to the group chat. I can’t figure out which hosting site to use when moving my blog from WordPress.com… Group chat. I want some feedback on my UNUM layout of my future Insta posts… Who better to ask than my PDR girls? I just reached a significant milestone on Instagram… They’re the FIRST people I want to share it with! And as amazing as having that online connection to each of them has been, the community that the Pangea Dreams Retreats create doesn’t end there. Not even close. Less than a month after the retreat ended, one of the girls (the retreat’s photographer @samkat) called me up and asked if I wanted to go to the Dominican Republic with her the next day. She had landed a collaboration with a hotel in Punta Cana and wanted someone to hang out with and help her get the content she needed. I booked a ticket that day and only 24 hours later we were reunited in the Dominican Republic. We spent an amazing three days together hanging out, tanning, doing whatever it took to get “the shot”, and laughing all the while at how ridiculous we probably looked to other people. What’s more, I got to the chance to learn even more about photography and how to shoot in manual. Sam gave me a ton of feedback on the shots I was taking and I loved being able to help her get what she needed for the collab. Coming back home, I didn’t have long to wait before I was meeting up with another girl from the retreat! Tracy, the founder of Pangea Dreams, came to LA and hosted a meet-up at The Butcher’s Daughter in Venice. Not only did I get to meet a former Pangea Dreams alum, but also a girl who was about to attend the retreat in Mexico (and who is now an official PD alum). Another Instagrammer, Sif from @icingandglitter, also came to the meet-up and recommended a book to me that has literally changed my life and improved my health (something I’ve been struggling with for over a decade, but that’s a story for another post). More than that though, I ended up booking a ticket to Barcelona to meet up with her only two weeks later. We explored Barcelona before she headed to Greece and I headed to London. It was so amazing to get to explore Barcelona with her because she had already been, and I live for insider tips on what to do/see/eat in a new city. We had so much fun and just really clicked while hanging out in Barcelona that we’re already planning a trip to Morocco together later this year! After Barcelona, I headed to London. I was in London all of 2 days when I got a DM on my Insta from a girl who had also attended one of the Pangea Dreams Retreats in Bali, but had been on a different week than me. The retreats are a week long, and typically two retreats are offered per location. Although we had never met before, and we had to work around our two different schedules, we both made it a priority to meet up in Windsor. Literally the day after Prince Harry married Meghan Markle at Windsor castle, I found myself in the Christopher Wren hotel in Windsor having tea, creating content, and reminiscing about Bali with a girl who had, just the other day, been practically a stranger. I loved every second of it! We got some really cute photos of us at high tea and I loved getting to know Harkey (@ohhmyparadise) and learn more about her and her life in the UK. It’s literally only been TWO months since I was on the retreat in Bali and I’ve already gotten first-hand experience with a hotel collaboration, doubled my Instagram following, made countless more valuable connections and drastically improved the quality of my content. From a place to stay if I should ever come visit, to a free dental exam, someone to help me shoot content, a shoulder to cry on, the chance to skydive for the first time, and more support and encouragement than I could have ever dreamed of, it has become so obvious to me that the benefits of attending a Pangea Dreams Retreat extend far beyond the 7 days of the retreat itself. And just think, this all literally happened within only TWO months of attending the Bali retreat. I can’t even imagine what will happen over the course of the next year! I’ve come to learn that with the support of such an amazing community of strong, like-minded women behind me, there’s literally nothing I can’t accomplish. About the author: Kate is a part-time editor and a full-time Goal Digger. She’s been traveling non-stop for the last 11 months with only a carry-on, a camera, and a goal – 196 countries before her 30th birthday! She hopes to inspire other women to live the life they’ve always dreamed of and achieve even the most seemingly impossible goals.